When you are driving long distances during certain seasons of the year, it is common for bugs to coat your windshield. In states like Florida, when you drive through swampier areas, bugs are abundant. But, what do you do to clean the muck off your car so that you can continue on your way with a clear view ahead? The team at MyDriverLicenses.org has developed these tips to make cleaning your bug-coated windshield a bit easier. Even though it is not a pleasant sight to witness a bug splattering on your windshield, it is worse to have to stare at the aftermath rather than to take care of the problem. The experts at MyDriverLicenses.org encourage drivers to take care of this problem in order to eliminate any distraction from the road. A dead bug or several dead bugs that have accumulated on your windshield will hurt your visibility and affect your focus. The easiest way to clean the bugs off your windshield is to stop at a gas station. Pull into the area near the gas pump, and put your car in park. Then, locate the squeegee and fluid used to clean windshields and windows manually. Work the fluid back and forth over your windshield and put some elbow grease into the process. Once you have a clear windshield, you can get back on the road. Some rest stops are equipped with quick windshield washer mechanisms at the exit. The experts at MyDriverLicenses.org recommend getting in line for this powerful wash, which is sure to give your windshield a quick cleaning. Just look for a contraption that is shooting powerful water into other vehicle windshields, and you will have located the automated windshield washer. Even though using your windshield wipers and blasting fluid at the bugs is not always the most effective way to clean your windshield, it should be looked at as a method to use before you get to a windshield washer or a gas station. 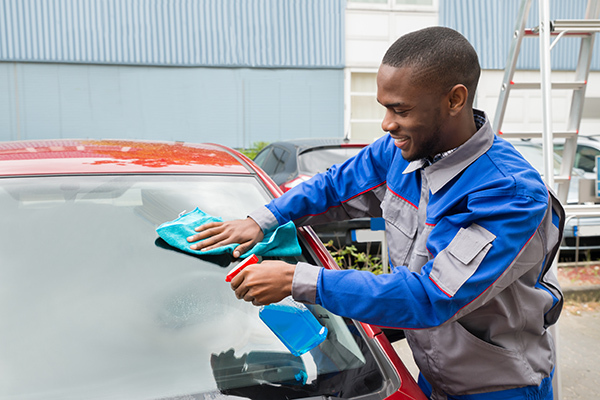 In order to use your windshield wipers to clean bugs from your windshield, the team at MyDriverLicenses.org recommends making sure your windshield wiper fluid store is full. If you do not have a lot of fluid to work with, you may not be able to get a good cleaning at all. In addition, if your wipers are on their way out, this may not be effective in the least. You need to have fresh windshield wiper blades in order for this to work. If you are stuck on the road with no civilized stop in sight, you may have to work on those bugs yourself. It is important to have a chamois cloth or an old rag stored in your car for long trips, so you can buff out the bugs coating your windshield. The team at MyDriverLicenses.org reminds you to pull over to the shoulder when you need to clean your windshield of bugs so that you can perform this task in the safest way possible. The easiest way to use a cloth or a rag for cleaning is to first run your wiper fluid over the windshield and then work the fabric in a circular motion until you begin to clear the smudges.